Code Inside Blog | How am I going to find out if .NET 4.5 is installed on my system? How am I going to find out if .NET 4.5 is installed on my system? It seems to be an easy question but there are also some traps. The reason is that theoretically it is possible to make a difference between CLR Version and Framework Version. In the times of .NET 3.5 it was usual to keep the CLR version still on version 2.0 because there are only new libraries added to the framework. 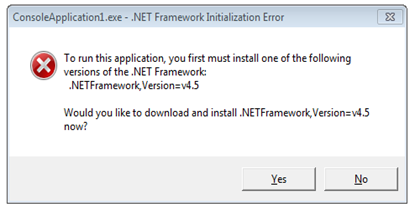 But “.NET Framework 4.5” usually means the combination of the “newest” frameworks and CLR Version. Although .NET 4.5 is an “in-place-upgrade” for .NET 4.0 what makes the whole situation even more complicated. Easy check for: Is the .NET Framework Version 4.5 installed or not? In my cases it is: Jepp - .NET 4.5. Unfortunately this test will only work if you are the system-admin and in full control of the system and the applications. Does my application run with .NET 4.5? This doesn’t mean if the application is “compatible” to .NET 4.5 but if the application is able to use the .NET 4.5 features. It’s kind of difficult to answer this question since this depends on the app.config or the web.config and if the IIS is in the game you have to configure the AppPool properly. If the Runtime the TargetFramework needs isn’t there you will see another error message if you try to run the Webapp. Since the framework always includes several libraries and every library has a different version number and a different Runtime you might test properly if there is something like a special class for example.